Editor’s note: Emanuele Ottolenghi is a senior fellow at the Foundation for Defense of Democracies in Washington DC. The views expressed are the writer’s own. 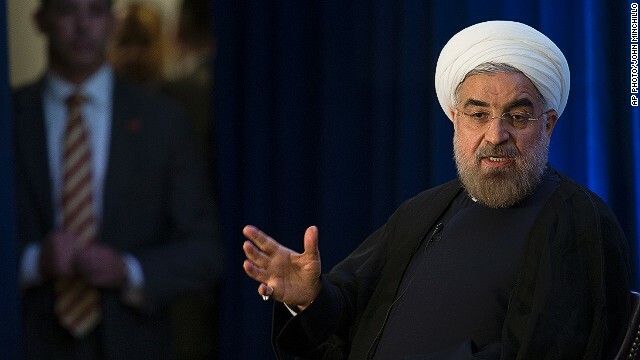 Iran’s new president, Hassan Rouhani, has been on a charm offensive in an effort to improve relations with the United States. But thus far, his efforts have been little more than rhetorical attempts to “make nice” without substantive change. History shows the United States should be wary of rhetoric without action from Iran – and that Rouhani should consider some noteworthy regional precedents if he is truly serious in convincing the world of Tehran’s good faith. At critical historic junctures, unexpected symbolic overtures have been successful at bridging ideological divides. Late Egyptian President Anwar Sadat took the world by surprise when he traveled to Jerusalem in November 1977 and spoke directly to the Israeli people. German Chancellor Willy Brandt, for his part, kneeled in front of a Warsaw Ghetto memorial in 1970, a spontaneous act of contrition that became legendary. Had Rouhani, when speaking before the United Nations in New York in September, behaved similarly by taking responsibility and apologizing for the Marine Barracks Bombing in Beirut in 1983, or even the U.S. embassy takeover and hostage taking in Tehran in 1979, he may have found himself with some leverage. The recent anniversaries of both those events – the barracks bombing and the 444-day hostage crisis –meant now was the perfect time to acknowledge Iran’s culpability, thereby establishing Rouhani’s bona fide credentials. Tough negotiations over Iran’s nuclear program would still lie ahead, but the seeds of a potentially better relationship would have been planted. Instead, Rouhani sent his deputy to join other senior regime stalwarts in the annual hate fest marking the embassy takeover anniversary. Nobody is rushing to apologize. Apologies, of course, do not solve policy issues like the legitimate concern over Iran’s nuclear program and its support for terrorism. There are substantive ideological differences that require more than a simple nod to past misdeeds to fix. But diplomacy starts with conversation, and how that conversation progresses depends upon tone. Rouhani had the opportunity in New York to set that tone. He did not take it. In fairness, he has of late made great and refreshing strides within Iran to tone down some of the anti-American rhetoric. In his first hundred days in office, he started a debate on the merits of chanting “Death to America” at Friday prayers and national calendar holidays. This resulted in the removal of some billboards around the capital. He has temporarily, and in some cases permanently, released a number of high-profile dissidents, and he has appointed a worldly and polished group of diplomats, including a cadre of new nuclear negotiators, to engage the international community. It’s tempting to be excited by these gestures. But it’s important to remember that none are irreversible, none have gone unchallenged by the regime establishment, none reflect a strategic realignment of Iran’s worldview, and none have gone far enough to address the real reasons behind the three-decade long, deep and enduring hatred for America. Taking down posters and banning public chants are nice gestures, but are nothing new or meaningful. In fact, they are timid and tentative first steps, and are already the victims of regime pushback. At best, they are little more than a reaction to how Iran believes it is perceived on the world stage. Embarrassment has been effective in forcing Iran to reconsider how open the country is with its policies, but it has never triggered a long-term shift in those policies. In January 2008, for example, when then nuclear negotiator Saeed Jalili was ambushed by Euro-parliamentarians in Brussels about Iran’s very public executions, Iran confined hangings to prisons, away from the public eye. As international furor died down, Iran resumed public hangings. This anecdote is an important one to keep in mind as the United States works out how to proceed with a Rouhani determined to convince them that Iran has changed, especially with nuclear diplomacy now in full swing. Iran can be counted on to uphold the Islamic Republic’s founding ideology and, as a result, verbal overtures and apologies are not enough. What matters – and what the U.S. should seek – is a verifiable diplomatic agreement. True, there are some tentative signs that repression of the people in Iran is waning, like the release of high profile prisoners (which in some cases only amounted to a furlough and was as arbitrary as their initial arrest). But given Iran’s history, efforts like these can be seen as despotic benevolence, designed to calm international protests and give Iran’s battered image a facelift, more than a genuine change in direction on the human rights’ front. The same can be said of negotiations over Iran’s nuclear capabilities. Appointing diplomatic negotiators is not enough. A serious commitment from the regime should involve tangible steps on the nuclear file. Since taking office, Rouhani has had ample time to halt the installation of new centrifuges at the industrial-size enrichment facility of Natanz. He could have slowed enrichment activities. He could have offered more meaningful access to inspectors so better verification of Iran’s clandestine nuclear activities could begin. Ahmadinejad era appointees were very good at insulting and lecturing interlocutors, and it’s a welcome development that they’re gone. Their successors, while more pleasant as hosts, retain the same goals, something the United States would do well to remember in the coming months. Iran has perfected the art of superficial rebranding. It is reasonable to assume that the Rouhani presidency, unless action is taken to deepen the shallow rhetoric, is on that same desperate path in order to salvage the desires of a brutal regime. Next entry »Can Colombia build on its democratic opening?